We have listed these companies here because they have either been of considerable help to Mosaic and we value their professionalism, or we simply like the service they supply to clients. 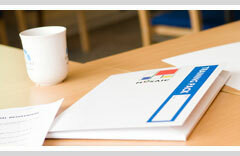 Rivernorth is a charity consultancy and training provider based in Scotland. We offer a range of services and resources for voluntary sector organisations who need additional support, advice or capacity to help them deliver projects. Our core areas of work are fundraising, business planning and monitoring and evaluation and we also help charities to optimise their online communications with supporters and stakeholders. Our website contains a growing range of free resources for charities including a grant directory, technology section and jobs pages. In our operations we take a particular interest in supporting environmentally sustainable projects and sharing the learning from this work. I worked with Mosaic to create this website, redesign their company identity and also produced the printed brochure outlining their courses. Popular services I provide include logo design and branding, brochure design, newsletters, annual reports, websites and other material such as invitations and mailshots for clients in and around London. With overheads at a fraction of larger design agencies, and with no salaried employees to pay, I can comfortably provide you with a highly professional and creative service – at a sensible price. View samples of work on the website. MLR PHOTO provides corporate and commercial photography for businesses. Two of our photographers, Joe Willcocks and Marte L Rekaa, worked with Mosaic to produce imagery from the training events for the website. Apart from events, MLR PHOTO also offers high quality photography of architecture, interiors, food, products and corporate portraits. We are based in London, but we'll travel anywhere you want us to! Photography is our greatest passion and we never tire of meeting new people, seeing new places and capturing their essence. We are used to working with people who hate being photographed, and we pride ourselves with offering a service that not only produces great results, but is an enjoyable experience as well. AdviceUK is the largest national independent charity representing organisations that provide free advice. Since 1998, it has been an approved provider of training & qualifications and has a dedicated Learning & Skills Team, who train and accredit the practice of hundreds of advice-sector practitioners each year. Our training is offered in areas that include Advice Skills, Key Skills for Reception Workers & Effective Supervision Skills for Managers in Advice Settings. We also run our flagship 'Learning to Advise' 11 week programme three times per year which covers each of main areas of social welfare law. In addition to training, we are a registered Awarding Organisation & currently offer qualifications in Advice & Guidance, Legal Advice, Management & Customer Service. Knowledge-Action-Change, an independent organisation committed to the development and promotion of evidence-based policies and interventions in the field of substance use and related areas of public health and public policy. The organisational ethos is to link knowledge transfer and organisational development to achieve impact at relevant organisational, community, national and international levels. We offer a wide range of integrated services which help facilitate change, from initial assessment, though to implementation, advocacy, communication, assessment and evaluation. Tyrrell Marketing has worked with Mosaic to help them make the most of their online and offline marketing activities. We provide businesses with flexible marketing expertise and advice. Whether you need support on a regular basis or just for specific projects, we can give you all the advantages of having your own marketing department but without the fixed overheads. We have a thoughtful and considered approach. By putting your business needs and ambitions first, we create the right foundations for success. This means that the marketing plans and activities we develop for your organisation are realistic, practical and focused on growth. Drawing from a tried and tested pool of creative experts such as Enticott Design and MLR Photo, we also ensure these plans are backed up by stylish communications materials. PC Mac Solutions has been supporting Mosaic's IT for several years. A combination of on-site visits and remote support allows us to maintain the computers and respond quickly when problems arise. Based in London, we are able to visit your premises or home. Also remote login support allows your computers to be serviced by us anywhere in the world as long as there is an internet connection. Esprit de Bois Services is led by Teresa Williams and Andy Stonard.